Election day is November 3, 2015. There are only a few contested races this time around; five candidates for the four “at-large” city council positions, as well as two candidates running for for District 5, which covers much of Roslindale, and District 4, which touches on a corner of the neighborhood. Even though there is no high visibility office up for grabs (e.g. Mayor, Governor, President), it’s absolutely crucial that we all get out and vote — elected people pay close attention to which areas vote in the highest numbers, so just getting to the polls at all helps our neighborhood get the attention it needs from the city. Moreover, election season is the perfect time to bring top priority concerns to candidate’s attention–such as our goal to make Roslindale the most walkable neighborhood in Boston. 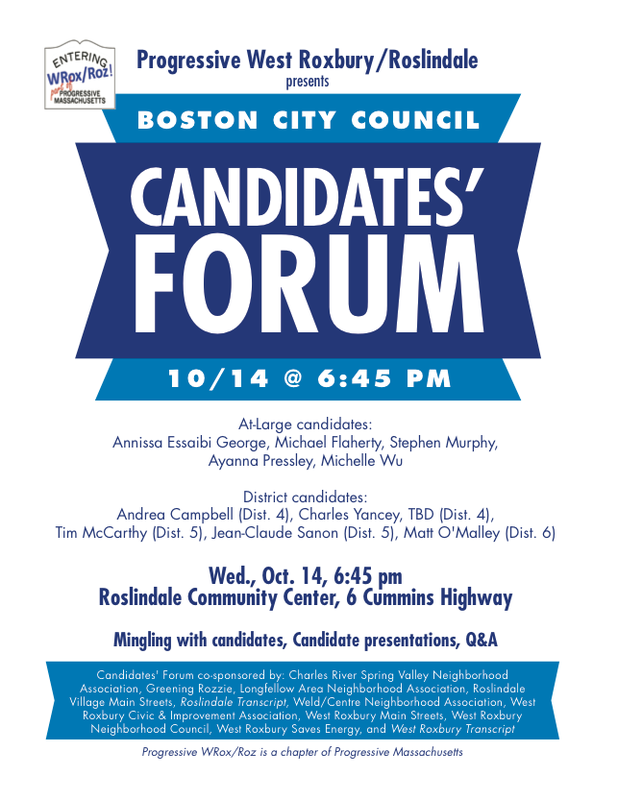 Against that background, Progressive WRox/Roz is hosting a city council election forum next Wednesday, October 14, 6:45pm, at the Roslindale Community Center. Voters can meet and hear from the five candidates running for City Council At-Large (Annissa Essaibi George, Michael Flaherty, Stephen Murphy, Ayanna Pressley, and Michelle Wu), the contenders for District 4 (Andrea Campbell and Charles Yancey, TBD), and the candidates for District 5 (Tim McCarthy and Jean-Claude Sanon). District 6 Councilor Matt O’Malley will also participate, although he is running unopposed. The evening will include mingling with candidates at the start and end, statements from the candidates, and Q&A. The evnet is co-sponsored by a number of Roslindale and West Roxbury neighborhood organizations and local media. Please show up to this forum and make sure these candidates know that walkability is a top concern in our neighborhood!